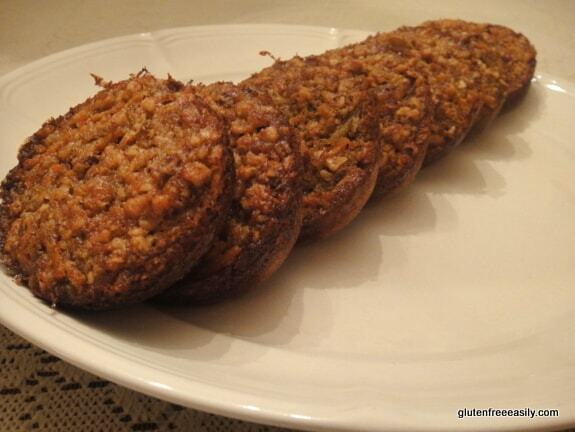 This post is linked to In the Gluten-Free Kitchen–Sharing Sundays. Cooking for Isaiah: Gluten-Free & Dairy-Free Recipes for Easy, Delicious Meals, the cookbook written by Silvana Nardone (of Silvana’s Kitchen and much more) was sent to me last fall for review. In fact, I received two complimentary copies—one for my review and the other for a giveaway. Isaiah is Silvana’s son. He was diagnosed with both gluten and dairy intolerances some time ago. Silvana set out to make recipes that would both heal and please her son. I flipped through Cooking for Isaiah and then read it immediately; I was impressed. I thoroughly enjoy reading and perusing cookbooks as much as I like making recipes from them. Silvana’s husband, photographer, Stephen Scott Gross, took all the photos, which include many lovely ones of their family. While full color photos of recipes are expected in a cookbook, the numerous other photos—in both color and black and white–definitely add to the appeal of this cookbook. I had all kinds of plans to try a ton of recipes—like I do every time I get a cookbook to review—but I’m finding that’s really not realistic given my schedule. I keep delaying on doing reviews thinking that some miracle will happen and I will get to make a bunch of recipes, but it never happens, so I’m pretty much going to be abandoning that approach to catch up with cookbooks in my review/giveaway queue. The important thing is that I give you, the gfe readers, a chance to check out books for yourself as we all have such different tastes and preferences. Rest assured that all of the cookbooks I share will continue to fit my gfe approach though. And whenever you have firsthand experience with a cookbook, I hope you will share those in comments as Casey (Live Your Art) so graciously did today on Cooking for Isaiah. Your feedback is always greatly appreciated. In the end with Cooking for Isaiah, I tried one recipe and that was a bit of a lark, or maybe serendipity. Allow me to explain. A few days after making Wendy’s (Celiacs in the House) crepes for dinner (we love that recipe! ), I began to make a Pina “Greena” Colada for breakfast using some leftover coconut milk I had in the refrigerator. I dumped the coconut milk into the blender and then added some pineapple chunks. But before I went any further, I noticed that the mixture didn’t look right and it didn’t smell right. It took me a few seconds to realize that I had added leftover crepe batter to the blender, not coconut milk. Of course, since I’d already added the pineapple, what the heck was I going to do with the mixture? I couldn’t make a smoothie that contained crepe batter. Then something clicked in my memory and I pulled out Silvana’s cookbook. 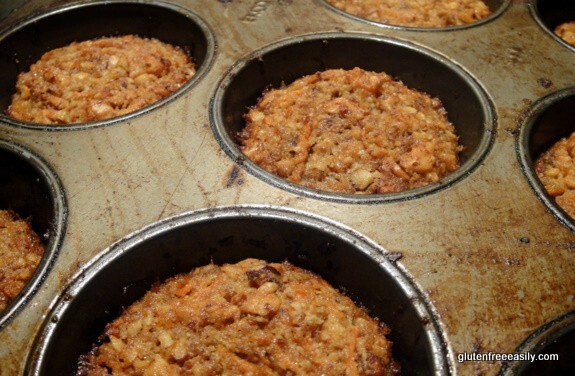 There was the recipe that could potentially save the day—Carrot-Pineapple Muffins. This all happened on the day after Thanksgiving. We were headed out on a road trip to visit several friends in North Carolina. 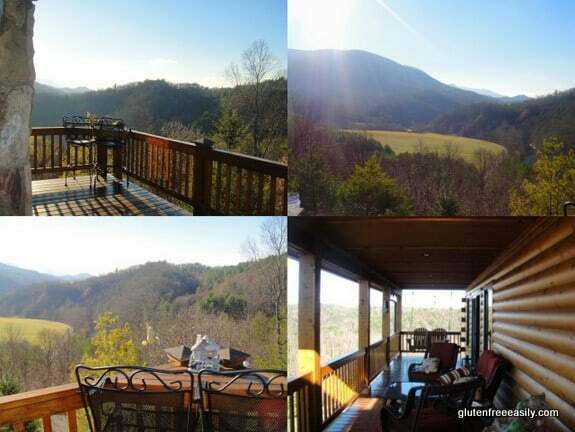 The first stop (after an indulgence at a favorite B&B) was to visit some friends at their mountaintop weekend home in northwestern North Carolina. We needed some homemade goodies to take to them, ones that could also do double duty as healthy car food for us. (Wine and our bees’ honey were already packed as other hostess gifts.) I kind of eye-balled the accidental mixture I had at that point because I hadn’t measured anything. So I added the remaining ingredients per Silvana’s recipe. The batter still looked a little thin (remember I hadn’t measured anything) so I added some almond flour for thickness and to increase the protein/nutritional factor. I really wasn’t sure how my crepes-turned-smoothie-turned muffins would work out, but the results were actually fantastic! Mr. GFE and our friends agreed. The combination of carrot and pineapple is a perfect one for sweetness. The almond flour and walnuts added nice weight and crunch. The muffins were also pleasantly filling, which was great when we relied on them for an afternoon snack and even breakfast for me one day. Note that my muffins turned out a bit flat, but that tends to happen when using almond flour in my experience. I’m not sure how these would look if made exactly per Silvana’s directions as there is no photo of this recipe in her cookbook, but I suspect they’d rise higher. I finally got to meet Silvana last month at the Gluten-Free and Allergen-Free Expo. Well, actually we met the first evening before the Expo started. I was waiting in the lobby for the shuttle bus to a special dinner hosted by the delightful folks at Rudi’s when the lovely Silvana walked by. I called to her and then introduced myself. Well, from that point on, we talked non-stop like old buddies until we arrived at Wildfire Restaurant for the amazing dinner that Rudi’s provided. 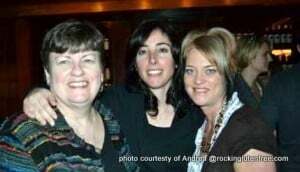 That’s me, Silvana, and my wonderful friend, Heidi (Adventures of a Gluten-Free Mom) in the photo below. Being gluten-free food bloggers, recipe creators, and moms of children with food intolerances, we had a lot to share with each other over four days. Another dear friend, Stephanie O’Dea (blogger and author of Make It Fast, Cook It Slow! ; More Make It Fast, Cook It Slow!, and soon-to-be-released Totally Together: Shortcuts to an Organized Life) often joined us, too. Some of the issues we discussed are echoed in Silvana’s beautiful and moving post, Everything I Know About Gluten Free (Plus, My Dairy-Free Knockoff Nutella Recipe). Of course, when it comes to the Expo and Silvana, what you especially want to hear about are the recipes that Silvana demonstrated and attendees got to sample—like her luscious chocolate doughnuts and her very popular jalapeno popper waffles. You’ll be happy to know that several doughnut and waffle recipes are included in Cooking for Isaiah. There are 135 recipes in all. About 50 of them require either her gluten-free flour mix or pancake flour mix. The latter is her flour mix with a few additional ingredients added. So both mixes contain white rice flour and starches like potato and tapioca. She’s gotten a lot of flak for that, but honestly, while I like to go crustless and flourless as often as possible and use more nutritious flours these days, I do use a flour mix that includes white rice flour for some of my baking. Unless you’re making these recipes often, using Silvana’s flour mix shouldn’t be a huge concern and you can most likely substitute another gluten-free flour mix of your preference with satisfactory results. While I’ve only made this one adapted recipe from Silvana’s cookbook, I think it’s a great cookbook. There are lots of naturally gluten-free recipes—which are always my favorite—as well as creative, fun recipes that the whole family will enjoy. If you click on the cookbook image above (or any Amazon links within this post), you can look inside Cooking for Isaiah to see recipe categories and an actual recipe from each category. How do Grilled Peach BBQ Chicken Wings sound? If you’re not convinced by the name, you will be when you see the photo. Finally, back to the really important part … I’m giving away one copy of Cooking for Isaiah courtesy of Silvana and her publisher! This giveaway ends Monday, June 6, at midnight Eastern. Here are the ways you can enter. Please leave a separate comment for each. ~ Leave a comment on why you’d like to win Silvana’s cookbook. ~ Tweet about the giveaway with @Shirleygfe in your tweet, share on Facebook and tag gfe in your post, and/or share on your blog. Leave a comment for each. This cookbook has been on my wishlist for a while. I’d love to win it! I recently discovered that I have a gluten intolerance and I would love to learn more delicious gluten free recipes! The past few weeks I’ve discovered so many wonderful blogs, checked out lots of new cookbooks from the library and I would be so excited to have Silvana’s book as my first gluten free cookbook! I was diagnosed as lactose intollerant at the age of 8, now I am 26 and was diagnosed with celiac disease about 3 months ago. I learned how to deal with the lactose intollerance being that I had it most of my life, but now I have to eat lactose free and gluten free. I can find things dairy free, and I can find things gluten free, but it is difficult to find things dairy and gluten free, including recipes. I would love to win this cookbook to help me learn new recipes that fit all of my dietary needs and actually taste good! I would love to win a copy of the book. I am on a gf, df diet as well as many other items I cannot eat (sugar, corn, soy, nut…) I have done fine for the first 2 months, but I am really wanting some more food options. This book sounds like t might have a few to try! Hi Kelley–It’s wonderful to see you again! 🙂 I’m glad you have done so well, but yes, new recipes like those in Silvana’s cookbook can offer more options. I’m sure coconut sugar could be used in place of sugar in her recipes often. I actually have the book, and have made several recipes, all of which have turned out well. Overall, I would recommend this book, especially for families that are GFCF. My son loves looking through it to pick out things to make. The recipes are easy and the ingredients are easy to find. There are three main cons to consider: 1. Starchy blend, as you mentioned. I have subbed some of the white rice flour with brown and still had good results. 2. High sugar. Yes, she owned a bakery, and you can tell. I would consider most of her breakfast recipes to be desserts, as written, but you can easily omit a lot of the sugary toppings. 3. Potential GF or CF ingredients are not labeled. If you are new to this type of cooking, you may not realize that most chocolate chips, an ingredient she uses frequently, have dairy. It never specifies CF chocolate chips, for example, nor do they make the notation for other potentially contaminated ingredients. That being said, my kids love the recipes and I use the book often enough to have stains on the pages! Hi Casey–Thank you so much for taking the time to offer such valuable feedback to my gfe readers! It’s great to know that brown rice flour can be subbed for white rice flour … I thought so. Do you recommend one brand over another? I like the finely ground brown rice flour myself. Great points on adapting by leaving out sugary toppings, too. Finally, I really appreciate you sharing the info on the chocolate chips. I admit that my mind already does that “conversion” and I don’t look for that distinction. The interesting thing about chocolate chips is we’re taught that chocolate with higher cacao content has no dairy, but we still need to read labels. I was surprised to learn that 60% Ghirardelli choc chips contains dairy, but their semi-sweet choc chips do not. I am desperately seeking cookbooks. Since my 11 year old son was diagnosed 4 months ago, I have tried many recipes I found online. I am looking forward to branching out. I don’t own any cookbooks that are specifically for the gluten free. Thanks for always doing a wonderful job, Shirley. I love the gfe approach. Struggling to learn how to cook gluten and dairy free-this cookbook sure would help! Hi Gina–Good to see you again at gfe! 🙂 Hope the struggles with cooking gluten and dairy free are getting less and less, but this cookbook would definitely help. 😉 BTW, my best helpers w/ dairy-free baking are olive oil, coconut oil, and coconut milk. Usually I can take any gf recipe of mine and work with those ingredients to make the recipe dairy free and delicious, too! I would love to win this cookbook. I am a picky eater…kind of like a kid! I don’t have any GF cookbooks, and this would be a welcome addition. Oh wow! I’d love this book because not only do I have Celiac Disease, but we just found out my son does as well. Anything that has recipes that are kid-approved are most welcome at this point. I would love to own this cookbook to help start my journey to a healthier, pain-free life. Thank you for the opportunity to experience gfdf recipes! When we first became gfcf again, I was checking out books at the library. I have since checked this wonderfully amazing book out 12 times! I would love to have this book. You would think i know all the recipes by heart! I also think the library would like to have their worn cookbook back on a more perm basis! Hi Blair–Yours certainly has to be one of the best endorsements of Silvana’s cookbook! 🙂 Very cool on already writing a book review of Silvana’s cookbook. I’ll have to mosey over to your blog, Bounty from Our Family Table, and check it out–thanks! Happy Summer to you, too, dear! I would love to win this cookbook! My husband, oldest son and I are all gluten free, my son and I are also dairy free, so new recipes that fit into our diet are always a treat! Too funny on the smoothie, but nice save! Silvana’s cookbook is gorgeous and so creative. Love it. I checked Silvana’s book out from the library and almost broke the copyright laws because I wanted to copy so many recipes. Save me from a life of crime and let me win this book. Hi Johanna–LOL … another resounding endorsement of Cooking for Isaiah–very cool! Great giveaway entry, too. If only the random number generator wasn’t random. 😉 We’ll see what happens! I love to bake and love to read cookbooks. My daughter,who has Asperger’s, responds well to a gluten-free diet. So Silvana’s book would be a great fit for our family! I would like to win a copy of this book because I like almonds and I have noticed on her blog she uses them quite a bit in her recipes. Thank you for the chance to win a copy! I am also a subscriber to your blog via email. I’d like to win because I am tired of special ordering the book from the library!! I get your blog via e-mail. Hey Robin–I’m beginning to wonder if Silvana’s cookbook isn’t the most checked out cookbook in the U.S. 😉 Very cool! Thanks for the entries. I subscribe to GFE via email! GFE rocks! you look so lovely in that photo! I already have the book, so I’m good on that front. I haven’t tried recipes yet because of the move, but look forward to it. I’d love to learn how to bake with gf challenges! I’ve really enjoyed following her blog. She’s got some great recipes! You can’t go wrong with pineapples, carrots and walnuts. Sounds like you did some fun and successful experimenting. That’s the way I do most of my baking. The only bad thing is when you don’t write everything down and you want to create it again later! Also, that view from your friend’s place in NC is amazing. That looks like a B & B! Love the photo of you girls having a good time at the Expo as well. And — last, but not least, Silvana’s book is wonderful! I have a child on a GFCFSF+++ diet – I’d love to add this cookbook to my collection. I follow gfe by featuring it in the sidebar of blogs I follow on my own blog. Does that count? I am new to this Gluten free life as my husband recently found out why he has been soo sick. We have dided to make the whole house gluten free this summer, and with two kids its challenging finding good recipes they like. I would love to win Silvana’s cookbook since it was made with recipes for kids!! Love reading the blog, I get lots of great ideas, so thank you for what you do! Hi Christine–Welcome to gfe and welcome to gluten-free living! Major kudos for making the whole house gluten free. 🙂 I know it can seem overwhelming at first, but if you start looking at all the recipes that you already love that are gluten free or easily adapted, that can help a lot. 😉 Silvana’s cookbook would be great for you all for sure. Many thanks for the sweet feedback (and subscription!) on gfe! Shirley – don’t you love it when a recipe accidentally comes together like that? I would be doing the happy dance in my kitchen! 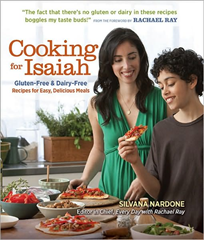 Cooking for Isaiha sounds like a great gluten free cook book for anyone’s kitchen. Ina–LOL I do love it! Yes, I did the happy dance after I ate one of these muffins and almost did one every time I ate one after that. 😉 Cooking for Isaiah is a wonderful cookbook with such a fun variety of recipes! I have wanted this book for a l-o-n-g time! Not only for the recipes, but I so enjoy personal stories, also. Hey there, Susan–So good to see you and I see you are another fan of Silvana’s! 🙂 Personal stories really make a cookbook worthwhile, don’t they? I follow you everywhere! I am just getting ready to start baking gf, after years of eating a lot of produce. This book sounds like the perfect addition to my growing collection of gf cookbooks! No need to enter me because I have a copy but I just wanted to say what a lovely review of a lovely lady! I would love to win this book because I am always looking for great GF recipes, and it would be great to have a book of recipes that I don’t need to adapt. I’m newly GF and have heard great things about this cookbook! I’d love the chance to win it! Hi Amarit-Congrats on being gf and welcome to gfe! 🙂 Obviously what you’ve heard on Silvana’s cookbook echoes so many comments here. 😉 Thanks for entering! I would love to win this cookbook for myself and my two daughters who are all on the gluten-free diet for celiac or gluten sensitivity. We love trying new recipes together. I already catch your tweets on twitter! I’m already a Facebook fan of gfe! Last but not least…I just tweeted about your giveaway. Thanks for the chances to win! I’d love read and win this book! thanks for doing this…I’d love to add it to my collection! posted it on my new blog too! I’m new to gluten free with two little ones and one big husband in tow. I’m hoping for new inspirations. Hi Karen–It looks like you’re new to gf and gfe—welcome! 🙂 New inspirations and recipes the whole family loves are what we all want. 😉 Thanks so much for entering the giveaway! I’m relatively new to gluten free and would love this book! Hi Meghan–It’s so nice to have you here! Thanks for entering the giveaway. 🙂 It would be a great resource for you.